Q. 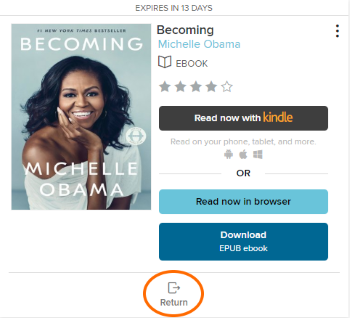 Can I return ebooks borrowed from OverDrive early? You borrowed an eBook or audiobook AND haven't selected Read now with Kindle or Download yet. You borrowed a streaming video AND haven't selected Watch now yet. To return a title from your Loans page, select the Return button. Once you download a title, add it to the OverDrive app, or start watching a streaming video, the Return button disappears from your Loans page. Instead, you'll see a How to return button that explains how to return that title early (if it's possible). You can only return a streaming video that you've watched (partially or completely) if you've added it to OverDrive's app for Android or iOS.